Fly Tying materials. Yummm. What’s not to love about beautiful Rooster Capes? That’s right. Easy on the eyes, fair on the wallet, and spectacular on the hook – that is – if you find the right feather structure and colors for the flies you are tying. Up front disclosure – I am an unabashed fan of Hareline Dubbin. Their product line is so deep and broad that it makes me drool. I decided to write a series of product reviews to 1) highlight some of Hareline’s products that tyers might not be familiar with, and 2) share my thoughts on various applications of these products. Lately, I have renounced my addiction to rabbit and marabou leeches and refocused my attention on hackled steelhead flies. You know, the flies we used to catch steelhead on: Fairly simple traditional steelhead flies tied with a hackle “collar” or “beard”. 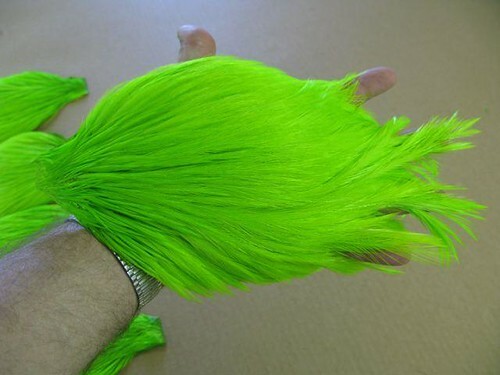 So in my usual fashion, I proceeded to look for hackles to tie a supply of these little beauties. Out of the blue, Hareline Pro Grade Streamer Capes popped up on my radar screen. I have always been a great fan of the Hareline Dyed Rooster Saddles for tying steelhead and salmon flies, but until recently, the Streamer Capes eluded my attention. Then in a flash of light (sort of) I found myself standing next to Bob Borden as he arranged a mountain of the most beautiful white Rooster Capes I have seen in years, maybe ever. He smiled that all-knowing smile, and proceeded to tell me a little about the capes. American grown and processed right here in Monroe, Oregon. High feather count. Moderate amount of web. Good hackle range. Versatile. Dyed in Black, chartreuse, hot orange, and purple, in addition to white. I looked over a pile of the whites. 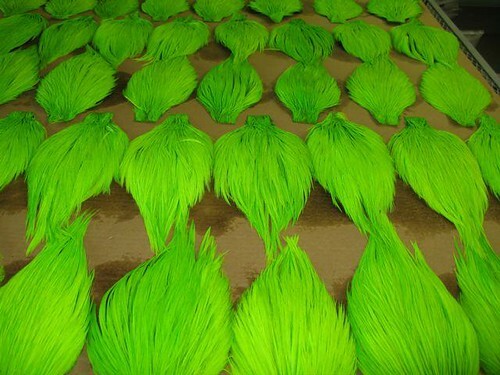 I photographed a batch of chartreuse Bob was laying out to dry. 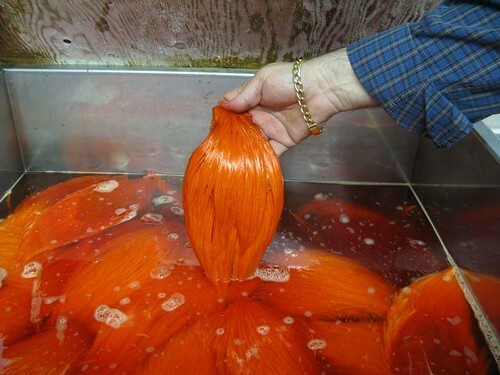 I peered into the dye vat as Marcos checked a batch of hot orange capes. Ooohhhhhh man, these looked good. I pushed and pulled, fiddled and fussed, spread out feathers, checked stems, and felt for fullness on several dozen capes. Oh Boy. “Honey, it’s me. Yeah, I’m down at Hareline. Yeah, I found some really great feathers. Yeah, I know I told you I had everything I needed for quite a while – but – these are so good, and Bob says, “when they’re gone they’re gone. Yeah, I know. Yeah, I know. Ok honey, just a few – for now – I’ll order them from the Caddis Fly” (note blatant biased advertisement here). Here are a few characteristics worth noting about these capes. 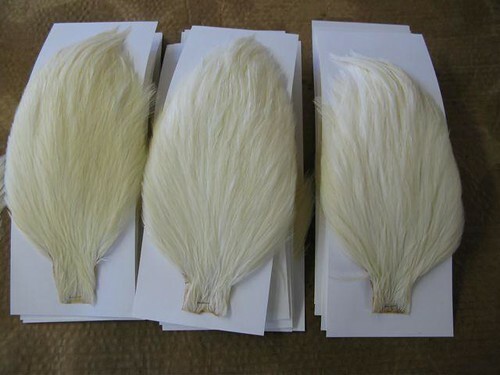 •	I have found these tie very nice hackle collars for my Steelhead and Sea-run cutthroat flies, and – joy of joys – they have made some great Comets too! •	And yes, when they’re are gone, bye-bye! Sorry, this review has demonstrated one of my many shortcomings as a fly tyer, specifically; I have limited experience tying STREAMERS! After all, these are Pro Grade STREAMER CAPES. These are not advertised for the types of flies I have found them most useful for. What to do? Y’all tell me. 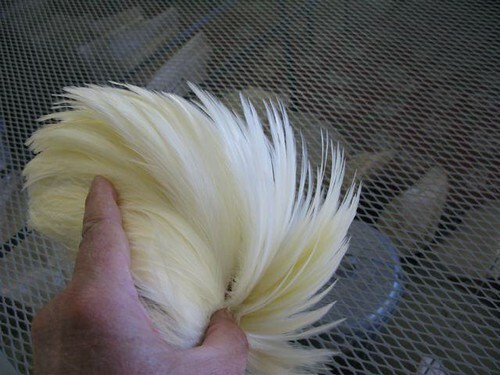 I look at these beautiful curved feathers that range from very small to very large and my imagination runs wild on streamers. 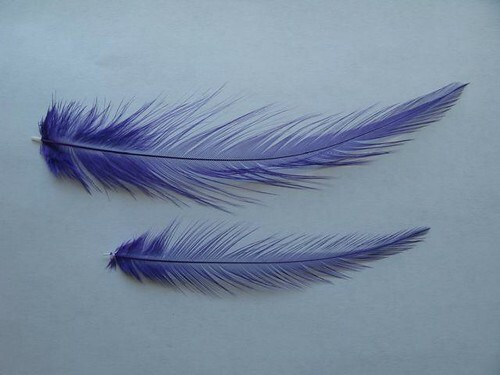 These feathers could be faced with dull concave sides together or with shiny convex sides together – a making for either a slim streamer wing, or a traditional, curved, pulse-in-the-water wing. Sorry, I know these Capes will tie great STREAMERS, but I just finished my hundred dozen steelhead flies and promised myself I would learn to tie skaters this summer. So I’m depending on someone else to tie the streamers with these beauties, all-righty? Price per cape. Total cost with mailing.